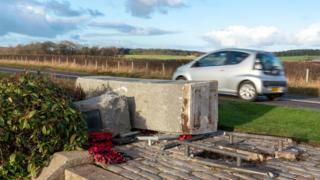 A motorist has been charged after a roadside WWII war memorial in Aberdeenshire was knocked over. The memorial on the A98 at Boyndie, between Portsoy and Banff, commemorates the men and women who served with the 'Banff Strike Wing' between 1944 and 1945. Police Scotland said a man, 29, had been arrested and charged in connection with alleged drink-driving on Sunday. Aberdeenshire Council said the memorial damage would be assessed.